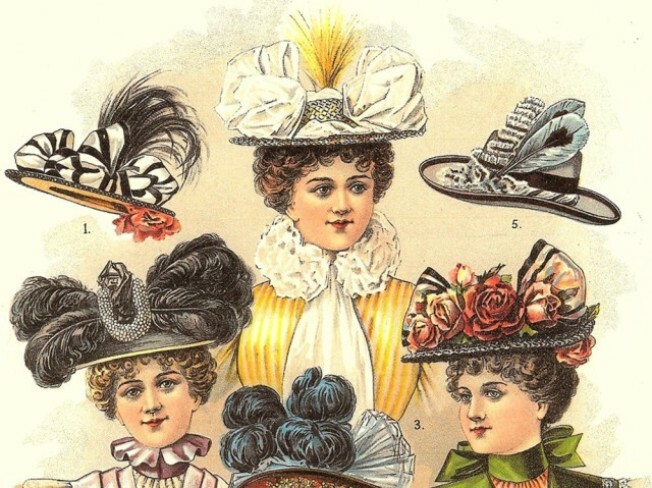 Vintages of Los Gatos offers a variety of antique goods, like this picture of fashionable hats from the 1800's. There are stores that you browse for a few minutes before merrily resuming your shopping trip, and then there are stores that are so absorbing that you find yourself sitting on the floor for over an hour with your mother and friend, sorting through the inventory like your life depended on it. Vintages of Los Gatos falls into the latter category. While it's true that antique lovers can be a wacky bunch, visiting Vintages is a surprisingly refreshing and down-to-earth experience that will keep even those with short attention spans enthralled for hours. Antique jewelry, milinery feathers, hand-soldered pendants and estate silver are just a few of the eclectic offerings housed in this small South Bay boutique. There is quite a bit of inventory but it is organized in a way that allows the visitor to discover it gradually instead of being overwhelmed all at once. Case in point: the chest of old maps and photographs that so intrigued me and my shopping partners. If you have even the slightest interest in vintage paper goods, stepping through the doors of this small South Bay boutique is like dying and going to heaven. My mother bought a women's magazine from the 1950s that had us in stitches over the retro fashions and recipes like "a slice of pineapple on top of a piece of lettuce with lots of mayonaise." I bought a 1947 children's book that I gave to a friend who recently had a baby -- she absolutely adored it (the book that is, although I'm sure she also likes her child). I nearly bought an entire basket of vintage wallpaper from the '30s, but decided to wait for another day-- after all, I'm planning on coming back many more times. Perhaps the best part of Vintages is the fact that the owners -- a husband-and-wife team -- run the shop themselves and are always on hand to answer a question about a rare postcard or a Victorian cameo. Overall, it was one of the most pleasant shopping experiences I've had in months.